Oh, look, the building has even been captured by the Street View cameras! 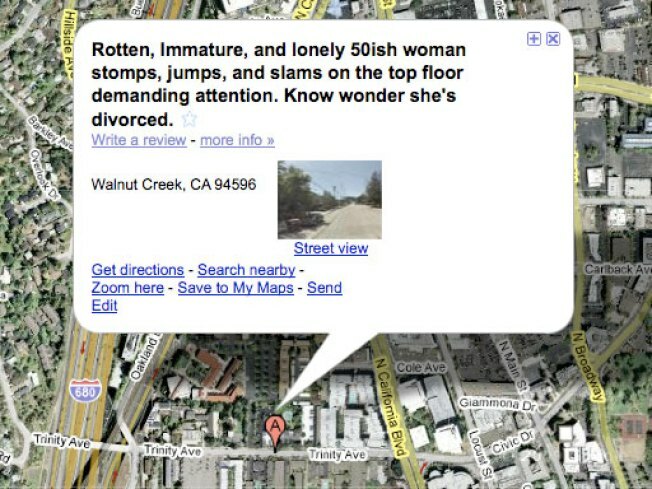 In the "I love mankind, but hate my neighbor" department, it seems someone's upset about a noisy woman in Walnut Creek. Rotten, Immature, and lonely 50ish woman stomps, jumps, and slams on the top floor demanding attention. Know wonder she's divorced. Google Maps allows users to add listings for businesses, but as a purely automated system with littler oversight, anyone can write anything they like. And you can can write your own review of this "lonely" woman on Trinity Avenue! It's certainly not the first time that the "artificial intelligence" Google uses has gone haywire -- hilarity abounds in the contextual advertising Google delivers, as well. Jackson West figures things are mighty awkward in the building about now.